Take Highway 101 North toward Highway 80, going to the Bay Bridge. Take the Fourth Street exit, which leads you down a ramp, placing you onto Bryant Street. Continue for one block on Bryant Street, then turn left onto Third Street. Continue for four and a half blocks on Third Street. The Westin is located on the left side of Third Street, between Market and Mission Street. 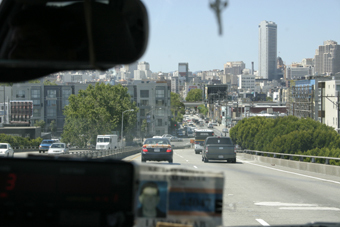 Take Highway 101 South toward and over the Golden Gate Bridge. Turn right onto Van Ness Avenue. Turn left onto Bush Street. Turn right onto Mission Street. Turn right onto on Third Street. The hotel is located half a block on the left side of Third Street, between Market and Mission Street. Take Highway 80 toward San Francisco. Cross the Bay Bridge and exit on Fremont Street (first exit on your right). Turn left onto Howard Street. Turn right onto Third Street. The hotel is located one and a half blocks on the left side of Third Street, between Market and Mission Street. Thirty minute ride to and from SFO. $4.75 each way. From SFO to The Westin - Take Dublin/Pleasanton train and exit Montgomery Street. To SFO from The Westin - Take Millbrae/SFO train at Montgomery Street station. Twenty minute ride to and from Oakland Airport. $4.85 each way. From OAK to The Westin - Exit the airport terminal and proceed outside to the island curb where you'll see a large blue and orange sign which reads "AirBART". Purchase a $2 shuttle ticket from the AirBART ticket machine. This shuttle bus departs every 10 minutes for the Coliseum BART station. Take San Francisco/Daly City OR San Francisco/Airport train and exit Montgomery Street. To OAK from The Westin - Take either a Fremont OR Dublin/Pleasanton train at Montgomery Street station. Various Limousine companies are available at the airport. 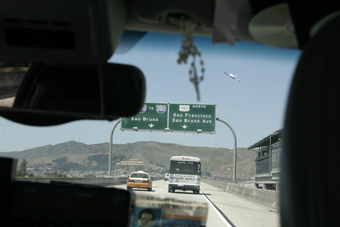 Direct transportation between San Francisco International Airport and downtown hotels, including the Westin. One-way fare is $13.00 - $15.00 depending on company selected. Airport ground transportation provided door-to-door, seven days a week. Pick up locations are located on the upper ("departure") level at the red and white loading zones for each terminal. Board vehicle for your sector of the city (downtown, Fisherman's Wharf). Advance reservations also accepted. One-fare is $13.00. 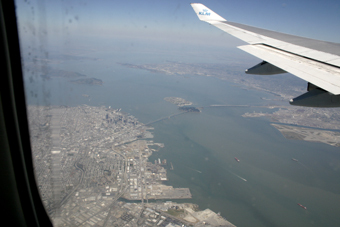 Direct transportation from Oakland International Airport to the Westin Hotel, San Francisco. Service available 24 hours. One-way fare from Oakland Airport is $23.00 - $33.00. To arrange transportation from the airport, contact either Bayporter at (415) 467-1800, or City Express at (510) 638-8830 from the Oakland Airport. Advance reservations are not accepted Credit cards are not accepted.To arrange transportation back to the Oakland Airport, please contact our concierge desk.